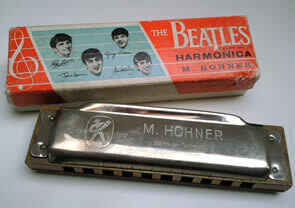 Further to our harmonica study of Love Me Do, we should now take a further look at John Lennon’s harmonica recordings with the Beatles. Not including the harmonica quartet on Sergeant Pepper’s For The Benefit Of Mr.Kite, we have identified at least a dozen Beatles tracks that feature harmonica. To be brutal, most of these are either ‘minor’ pieces from the band’s catalogue or else examples of Lennon’s harmonica work in its unaccomplished state. Rocky Racoon or Little Child for instance have particularly ‘unsophisticated’ harmonica parts. On I’ll Get You, the harmonica is badly out of tune.